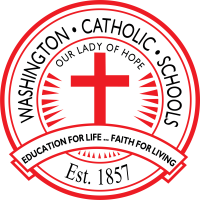 Washington Catholic Middle/High School is dedicated to excellence in education and to the spiritual development of youth within the framework of the Gospel and the traditions of the Catholic Church. Our fundamental task is the education of the whole person, blending learning with faith and faith with daily life. We strive to instill in our students a lifelong commitment to learning, to Christian values, and to community service. We are dedicated to achieving these goals in a supportive Christian community. Washington Catholic Elementary School strives to create a caring, stimulating and safe learning environment to insure that all students have the opportunity to achieve their fullest spiritual, moral and academic potential. We, as a part of the parish community, seek to provide a Catholic foundation of personal development and educational opportunities enabling our students to grow and conduct themselves in a manner that reflects credit upon themselves, their parents, our school and the Church.